The CryptoShield is a collaboration with Hacker In Residence alumni Josh Datko. The CryptoShield is a dedicated security shield. This shield adds specialized ICs that perform various cryptographic operations which will allow you to add a hardware security layer to your project. It also is a nice device for those performing embedded security research. The CryptoShield is design to work with not only the Arduino ecosystem but with embedded Linux boards that support the Arduino shield form-factor. As we cover each of the components below, we'll discuss how to use the shield on each type of device. In this tutorial, we'll tour the features on the CryptoShield and show you the software resources available for you to start using the device. 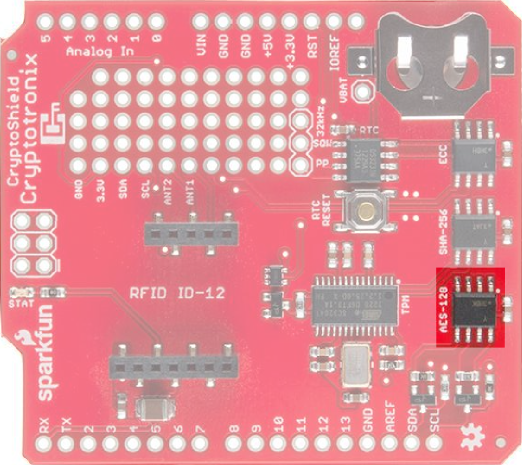 A dev board that supports the Arduino R3 form-factor like the RedBoard or pcDuino3. RFID Starter Kit if you want to use the RFID socket on the CryptoShield. 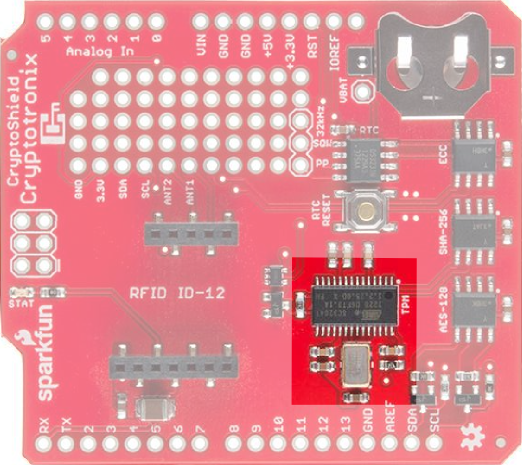 Any board that directly supports the Arduino IDE and the Arduino form-factor. 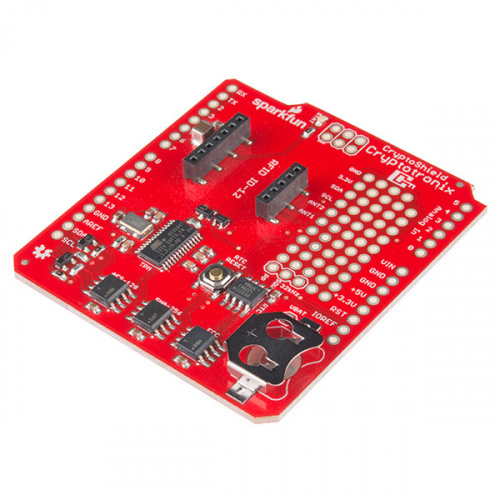 The CryptoShield is 3.3V and 5V friendly. The CryptoShield contains onboard logic level conversion circuitry. If the main board is properly supplying IOREF, as per the Arduino board specification, then the CryptoShield should work without any external voltage conversion. The Real-Time Clock is used to keep accurate time, which is often useful in security protocols. The clock on the CryptoShield is the DS3231M. It's attached to the I2C bus with an address of 0x68. On the CryptoShield, we added a small SMD button that attached to the RST pin of the RTC and is connected to the pad labeled RTC Reset next to the RTC. PP stands for Physical Presence, as in, pressing the button confirms physical presence. The neat thing about this button is that the RTC will perform hardware debouncing on it. Bouncing electrical noise that results from the springy mechanical contact of a button or switch. It's best shown in a picture. Below is a picture of a switch that exhibits this bouncing effect. This figure is a screenshot from the Salea Pro 16 (see here for the Pro 8). Channel 0, the button, appears twice in this figure. On the top is the digital representation from the logic analyzer and the bottom is the sampled analog representation. While the hardware-debounce button is fun, you probably will use the RTC for its primary purpose: keeping time. Be aware, you must set the clock. It comes with a default time that won't be accurate unless you have a time machine. You also need a coin cell battery if you want the RTC to keep its time when you remove power from the board. You'll need to change the i2c-2 bit for the i2c bus on your board. Once that's complete, you should now see your RTC show up when you perform ls /dev/rtc*. The hwclock utility can be used to set the time on the device, assuming your system clock is correct. While this tutorial was written from the perspective of the CryptoCape for the BeagleBone, the directions on setting the time are applicable for any Linux platform. The device appears to be mostly compatible with DS1307 drivers, so you can use something like RTClib to communicate with the chip over I2C. The Atmel Trusted Platform Module (TPM) is the AT97SC3204T, and only a summary datasheet is available with an NDA. However, the full datasheet is not required because there is existing software support. The TPM conforms to the Trusted Computer Group (TCG) Software Stack (TSS) Specification version 1.2, which is supported by the TrouSerS Linux software. This chip is one of the more interesting on the Shield, it's also one of the hardest to use. It's easiest to use with a Linux based board but could be used on an AVR. On the AVR, you will have to write a lot of non-trivial software to implement your own driver. This TPM ships with the compliance vectors loaded. Compliance vectors are well-known keys that are used to test the cryptogrpahic operation of the TPM. You need to clear these vectors and generate your own Endorsement Key. See this blog post for further details. The kernel driver for this TPM did not show up until Kernel version 3.13. Most likely, you will have to reconfigure your kernel to insert this module. This is easier with some board vendors than with others. Configuring your kernel for this module is outside-the-scope of this document. Once you have the module built and loaded, you can view this page for more instructions on the TPM. Some of the TPM application software in Debian Wheezy is a bit old so you can get a more up-to-date package at debian.cryptotronix.com. Out of the Arduino shield compatible boards I've tested (this is Josh speaking), none currently have native support for the TPM. I'm trying to work with them to add support. I tested the TPM by fly-wiring the shield to a BeagleBone Black, which does have the kernel driver built in. Atmel TPM Kit. This kit is for the AT97SC3205T, but it's mostly backwards compatible. There's code on the dev kit that provides an implementation for a TPM driver using a SAMS4. You might start there to port your driver. There is currently no Linux driver that uses the crypto features of this device. However, it may work with the generic EEPROM drivers as, without the crypto features turned on, it acts as a general purpose EEPROM. Atmel provides a library for AVR based systems. It won't build in the Arduino IDE but it should work with Atmel Studio. The device acts like a normal EEPROM without the crypto features turned on, so you could use it with an I2C EEPROM Library in the Arduino IDE. On version 2 of the CryptoShield this device is the older ATSHA204 and not the ATSHA204A. You have three options for software with this Chip. Use Atmel's AVR library with Atmel Studio. Atmel's ATSHA204 AVR Library page has links to their software. If you don't want to build this from source but want to use an ARM based Linux board, you can add the Cryptotronix debian repository debian.cryptotronix.com and then perform sudo apt-get upgrade && sudo apt-get install hashlet. The Linux driver is the easiest option to use currently. 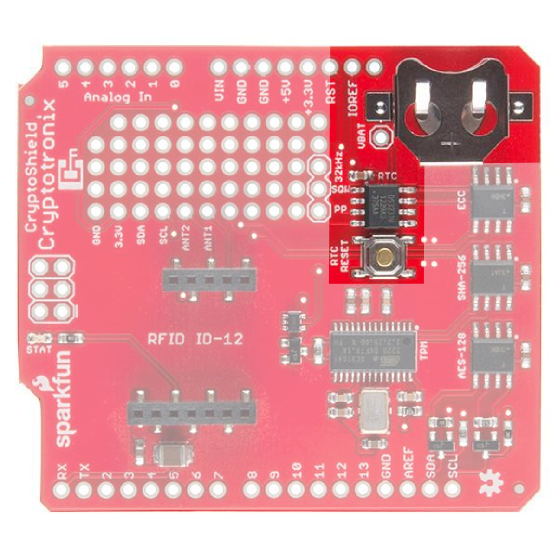 A third option is to use the Cryptotronix Arduino Library. For the ATSHA204, the software support is very limited. The goal of the library is to be a wrapper around the Atmel library to make using the ATSHA204 a bit easier to use. If you want to help, pull requests are welcome! 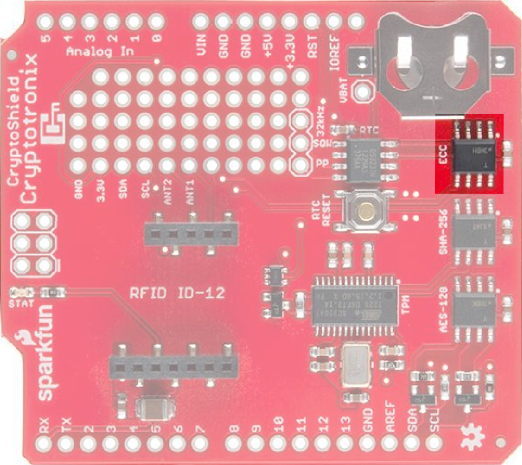 The Arduino library will use the EC108 to sign messages, but you must personalize the chip using the Linux driver first. The code is in development and pull requests are welcome. Like the ATSHA204, this chip must go through a personalization process that is irreversible. The above software driver picks reasonable default settings which should be sufficient for the majority of use-cases. 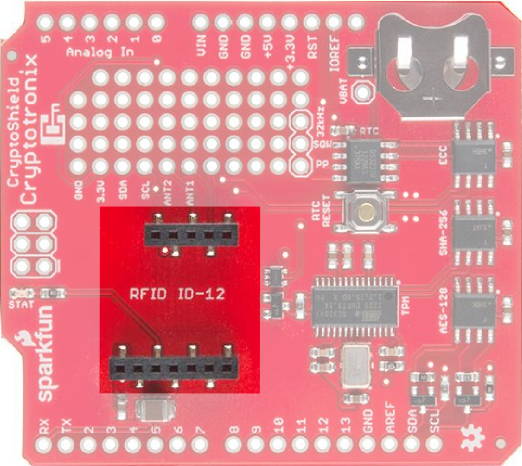 The RFID socket on the shield works best with SparkFun's RFID ID-12LA. Simply attach the reader and when a tag is read, the reader will write out to the Arduino hardware serial lines. It will also flash the "stat" light on the CryptoShield. Using the ID-12LA, the RFID tag, button, and capsule can all be read. An example Arduino sketch that will read the tag and echo it back over the Serial port can be found here. If you are using the TPM on a Linux board, then Chapter 4 of BeagleBone for Secret Agents should mostly apply. It shows how to add a keypad and combine it with the TPM to protect GPG keys. Josh is usually lurking on the #cryptotronix channel on Freenode, so you can catch him there. 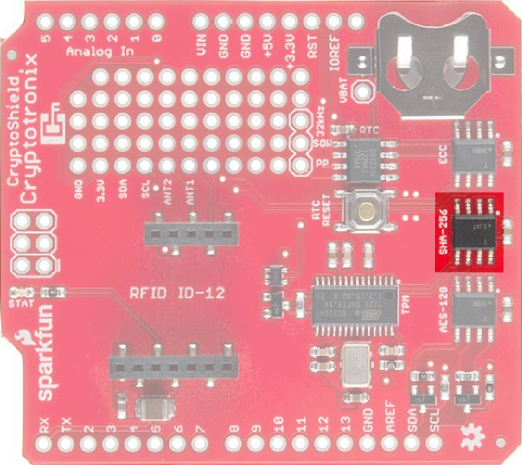 While you are joining IRC channels, hang out in the SparkFun IRC channel as well! Cryptography: A Very Short Introduction. For $11, this is the best introduction to Cryptography that I've read. If you are looking to learn more about the topic, start here. Cryptography Engineering. If you already have the background, then I'd check this book out next. It is more detailed, but the authors explain the concepts well. It also contains suggested exercises if you like doing homework.